1941 Chevy Coupe with chopped turned 3-window top, 1946 Chevy grille and complete smoothed body. Another Mystery Published Custom Car. 1941 Chevy 3-window Coupe Custom. 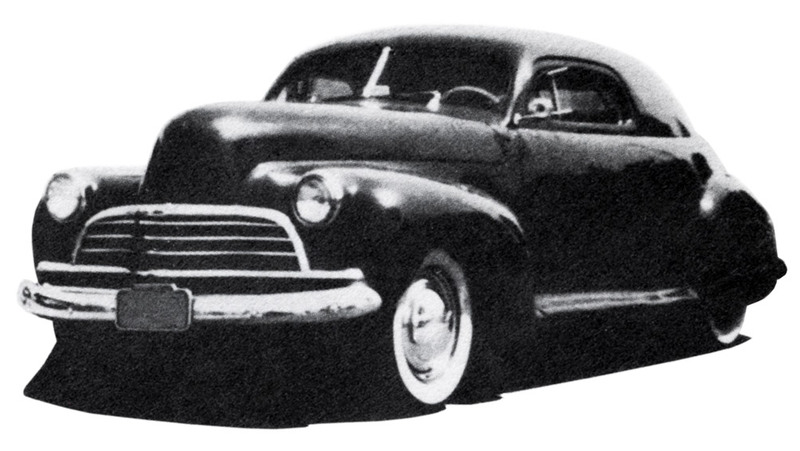 The first time I saw a picture of this ’41 Chevy Custom was possibly the last published photo of the Custom. It was in the Barris Kustoms Technique of the 50’s Volume 2 book published in 1996. 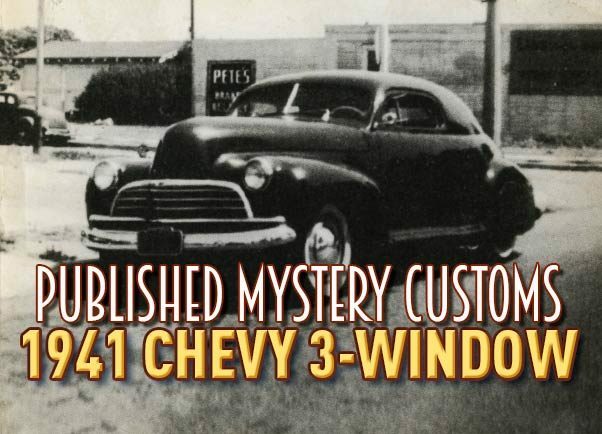 On page 13 there is a great photo taken at the Barris Compton Avenue shop showing this Chevy with white wall tires, listed as a ’42 Chevy – which it might be, instead of a ’41 – parking in front of the Barris shop with a ’41 Ford convertible Custom in the driveway. 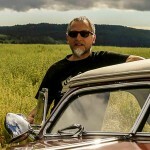 The photo caption mentioned that some work on the car was done at the Barris Shop… which is very plausible. The car really has this beautiful early Barris look and feel. There is no mentioning about the owners name in the Barris book. Later when I found an original copy of the Dan Post Blue Book of Custom Restyling published in 1951, I spotted another photo of what I think is the same Chevy. The photo in the Dan Post book showed the car with a nice profile photo parked in front of an used car dealer when it had black wall tires. There was no photo caption in the Dan Post book. Later I found out that the same photo was also part of the first time the Blue book was published in 1949. 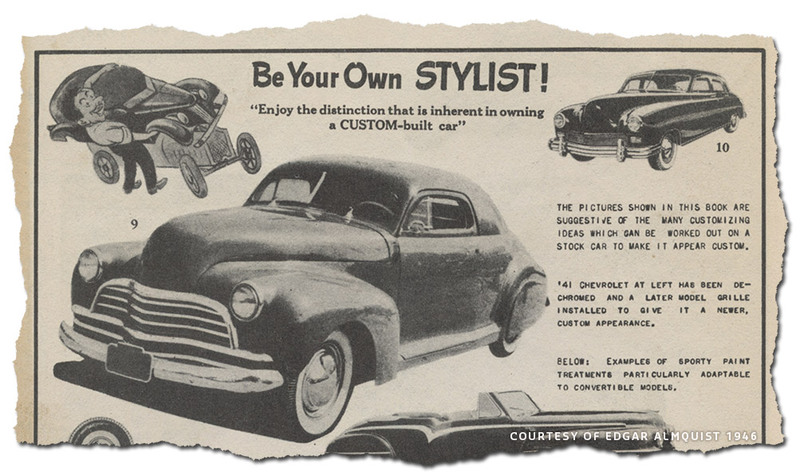 From the 1946 Custom Styling Manual published by Edgar Almquist. From the 1947 published Speed and Mileage Manual published by Edgar Almquist. It turned out that the more photos I found of the car, the further I went back in time with the publications I found it in. I bought a Speed and Mileage Manual by Edgar Almquist first published in 1947. It had a single photo of the Chevy, a nice front 3/4 view and in the photo the car had white wall tires, and the paint looked to be a bit lighter than in the Barris Book photo. The same photo was also used in Custom Styling Manual and Custom Streamlining published by Edgar Almquist in 1946. In this earliest published photo the car was listed as a ’41 Chevy, but no builder or owner name was mentioned. 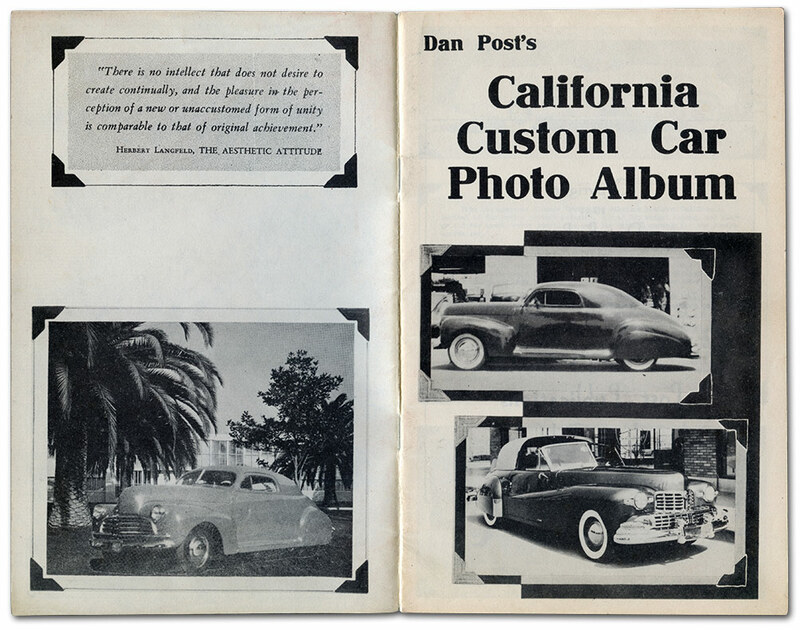 In 1947 Dan Post published his California Custom Car Photo Album booklet. The Chevy was shown in the booklet with no less than 5 photos. 4 of these photos show the car with white wall tires, and one with black wall tires. A side view photo was used on the cover, a front 3/4 view with the car in a lighter color on the back cover, and three more on one page inside the booklet. None of these photos had any photo captions, nor photo credits. 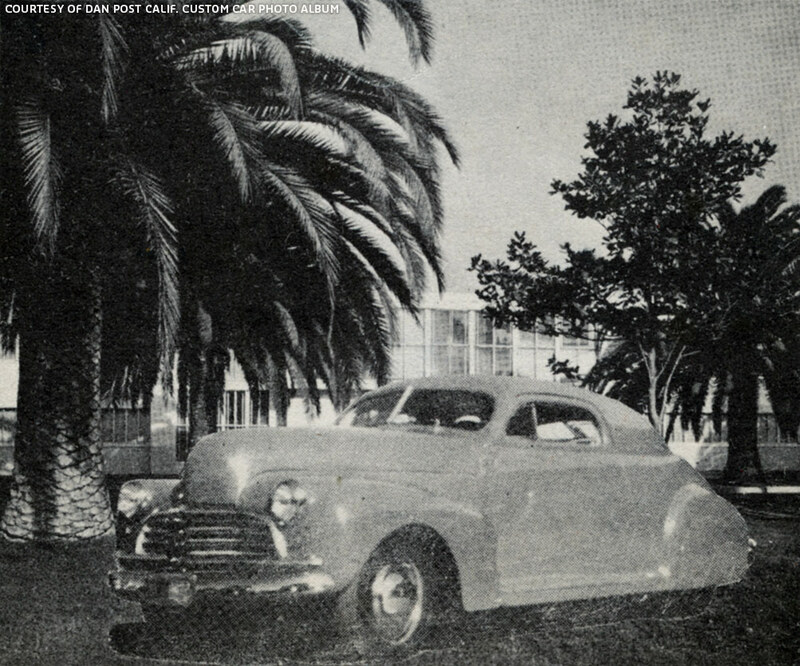 The front and back cover of the 1947 published Dan Post California Custom Car Photo Album booklet used two photos of the Chevy. 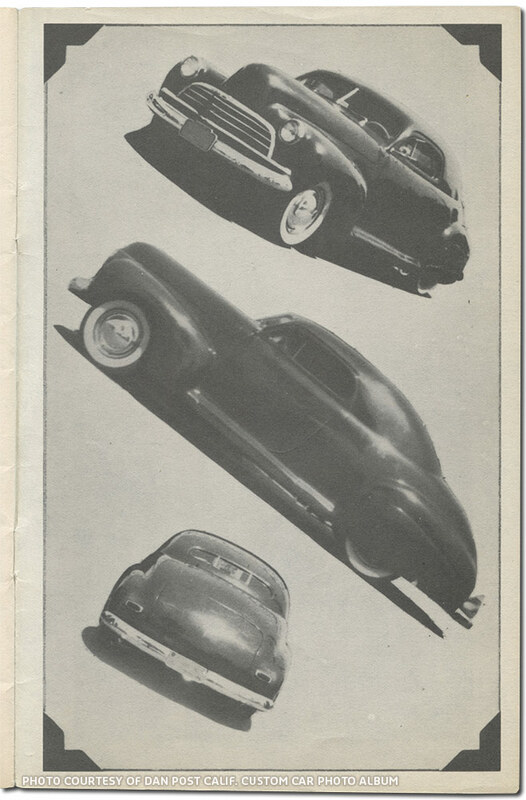 Dan Post devoted 3 photos of the Chevy on a full page in his ’47 published California Custom Car Photo Album booklet. I think that all these three photos, which have the background cut off, were taken at the Barris Compton Avenue shop. 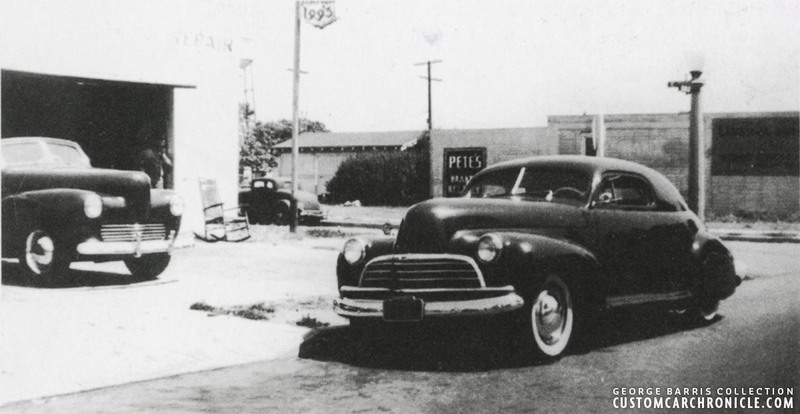 The photo shown on the cover of the Dan Post California Custom Car Photo Album shows the full side view of the car taken in front of the Barris Compton Ave shop. The photo is taken the same day, with the ’41 Ford Convertible peaking in above the Chevy hood, as the one shown in the Barris Techniques book. Wish a bit more of the back ground was shown in this photo, most likely taken in 1946. This is the only rear view photo I have been able to find. It shows how the trunk was shortened at least a foot at the top, the fenders are molded and blended into the body, and the rear window looks to have been cut down and made into a three piece unit (possibly Cadillac rear window cut down?) The rear bumper looks to be a ’46 Chevy unit. On the back cover of the Dan Post California Custom Car Photo Album this photo of what I think is the Chevy was used. It shows the car with black wall tires, and a lighter paint job. But otherwise identical to the darker colored photos. The photo looks to be a collage of the car cut from the background and pasted into the palm tree nice building photo. The only other photo I have found of the car so far comes from the internet in the very early years. I have no idea where it came from, but it shows the car in the dark paint, with white walls parked next to what I think is an early version of the Var Martin’s 1941 Buick with full fade-away fenders Custom restyled by the Barris Shop. The Chevy is a really beautiful restyled 3-window Coupe. Unsure if the car tarted out as a ’41 or 42 model. The top was chopped with a really beautiful flow on the rear of the top. It looks like the rear of the top is still located in the stock position, not moved forward like we see a lot in more preset day builds. This allowed the builder to create a really beautiful flowing line on the top. The rear quarter windows are filled in for an ultimate smooth look. 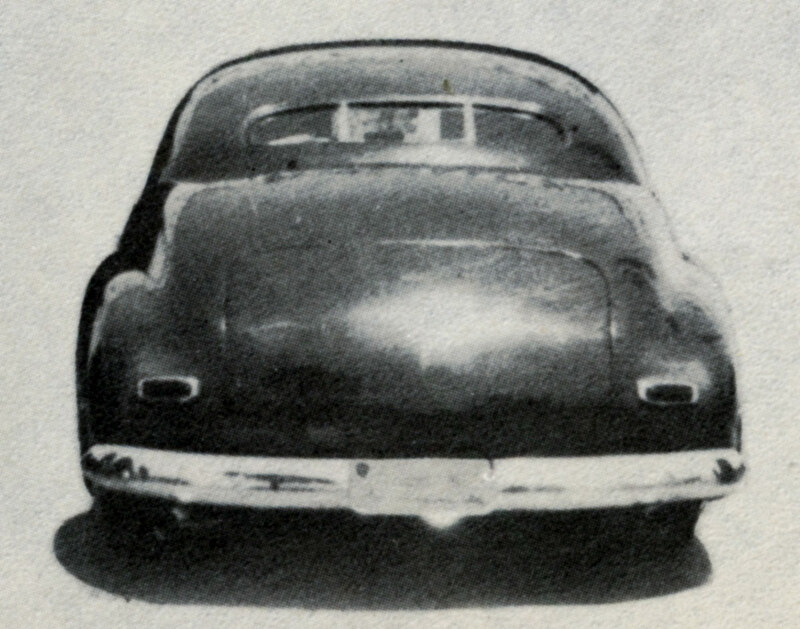 Filing in quarter windows of 5-window coupes, and even on sedans was a very popular Restyling technique used in the early days, the mid 1940’s. 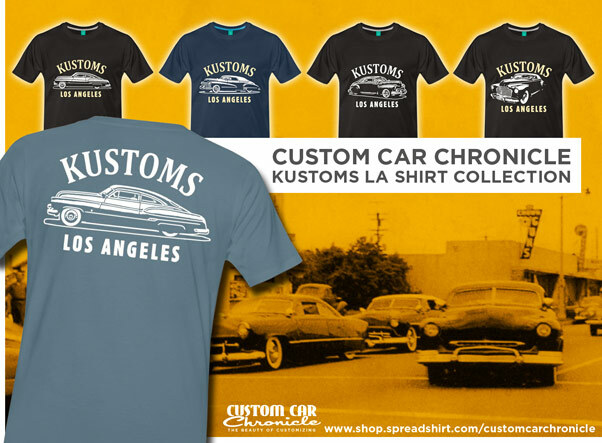 In the early days the most commonly Custom restyled Custom Cars, especially in California, where it all started, were based on convertibles and received chopped padded tops originally designed by the Carson Top Shop. These tops had the rear quarter windows filled in and a super smooth flow at the rear of the top. I think that a lot of early Custom Restyler’s liked this look, and when they chopped a coupe body filling in the rear quarter windows seamed a natural for them to obtain this favorable look. Later this filled quarter window look was reused on the twin ’48 Chevy’s restyled by Barris for the High-School Confidential movie in 1957-58. The rear window was either replaced by a three piece Cadillac unit, or home made. Plus it was cut down in the chopping process, unlike what was more common later on to just lay it forward to match the new roof shape, but kept its original height. The new small “mailslot” rear window is perhaps another inspiration things fro the popular Padded tops, which mostly had very small rear windows as well. 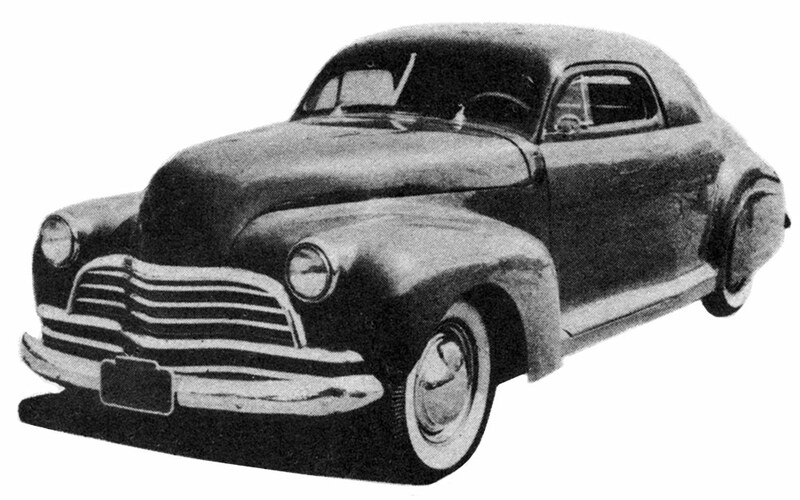 This profile photo of the Chevy was first shown in the Dan Post Blue book in 1949. It shows the car with black wall tires and dark paint in front of an unknown Used Car Lot. Not sure when the photo was taken. Photo from the Barris Kustom Techniques of the 50’s book. The photo caption in the book is: Also photographed outside the Compton Avenue shop was this ’42 Chevy coupe which had its top chopped, the door posts kicked forward, and the rear side window blanked. The running boards were molded as were the headlights. Notice that the hood was shaved and had its side trim removed and that we’d installed flat, extended fender skirts. The grille was from a ’46 Chevy. The fenders were welded to the body and flared into the body for that beautiful one piece molded look. All the trim and handles were shaved and the hood was relieved of its center strip and side scoops. 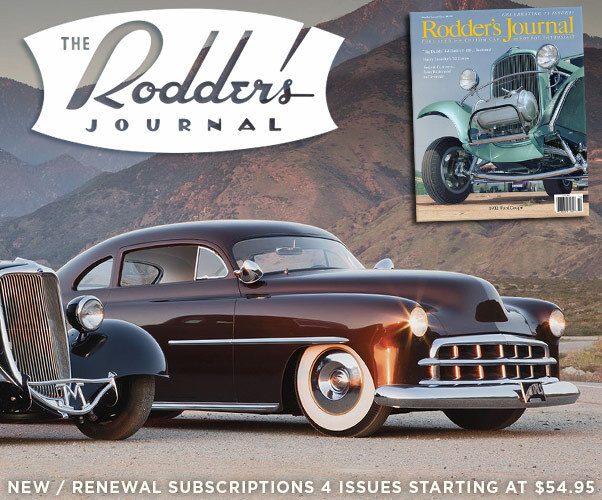 The front end was modified to accept a brand new at the time of the build ’46 Chevy grille and the bumpers front and rear were replaced with ’46 Chevy units. At the back the trunk was shortened at the top, not sure why this was done. The stock taillights were used and everything was smoothed. The car had tear drop shaped fender skirts added, and used smooth aftermarket hubcaps with beauty rings. The car looks and feels like an early Barris Restyled car, the Barris Technique book mentioned it was done, or at least partly done at the Barris Shop. This is the only written info we have on the car, and since it was photographed in front of the Barris Shop around 1946, it is most likely a Barris Created Custom, but who was the owner? and what happened to the car. Also when was the car the lighter color, before the dark paint, or after? and what about the white walls versus the black walls Which one was earlier? 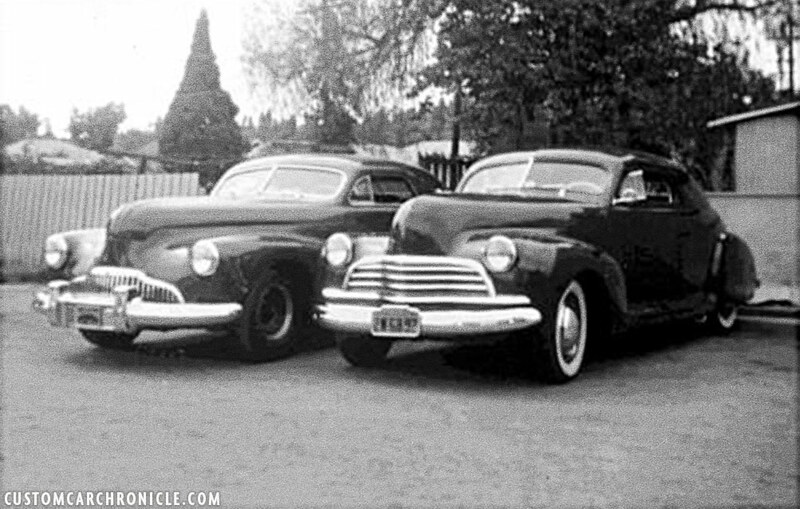 The Chevy Coupe parked next to what I think is an early version of the Var Martin Barris Restyled ’41 Buick. What a fantastic sight to see these two chopped 3-window coupe early Customs sitting side by side. Unusual for these early customs, (around 46-47, and possibly both restyled by Barris) is that both customs have no Appleton Spotlights installed. Quite a view photos of this car have been published, and most of them in early publications, but none of those I have found shed any light on the history of this car. If any of the CCC readers knows anything more about this Mystery Published Custom Chevy, please email Rik at the Custom Car Chronicle. We would love to know more about this early Custom Car, and be able to put a name to this well published Custom. Thanks for sharing this one, Rik. The top sure does have a nice flow and in spite of the deletion of the quarter windows doesn’t look too massive. I wonder what was the reason for the shortened trunk lid? I’ve always dug they look of a ’40s Chevy coupe made into a chopped three-window…this one has a nice look to it. Never noticed the shortened trunk and bars in the rear window….very interesting.